HomeAmerican Frontier: Firearms, Indian, Knives Lakota Sioux at Fort Meade Photograph 19th C.
Lakota Sioux at Fort Meade Photograph 19th C.
The lot features an original authentic photograph of a group of Lakota Sioux Native American Indians outside of Fort Meade, South Dakota dating to the 19th Century. The photograph is taken by May J. Stilwell of Sturgis, South Dakota. May Stilwell was relative to L.W. Stilwell of Deadwood, South Dakota, the famous photographer who photographed such famous warriors as American Horse, Chief Lone Bear, Red Feather, Sitting Bull, Woman's Dress, White Buffalo, Chief White Thunder, Chief Yellow Hair, Crow Eagle, and Rain-in-the-Face. Stilwell also was known to have photographed Buffalo Bill with various Indians. The piece is marked on the cabinet card, "May J. Stilwell / STURGIS. / S.D.". The photograph shows over a dozen Lakota Sioux Indians in ceremonial war paint and headdress standing around a large drum. 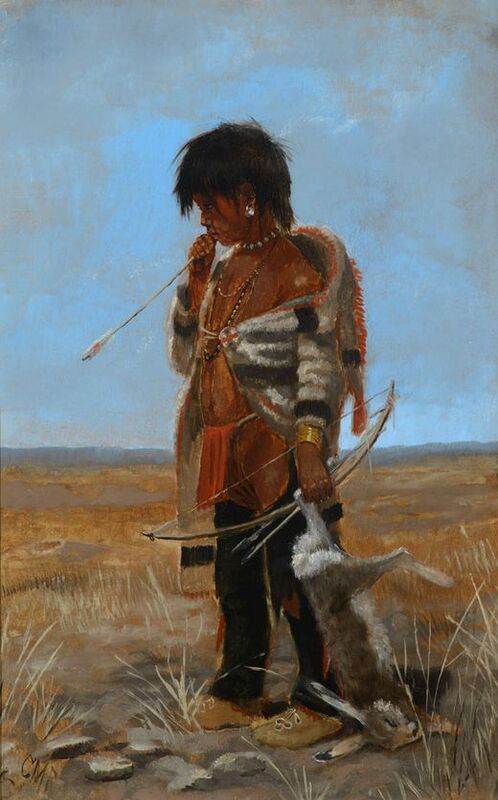 Some of the Lakota are holding catlinite peace pipes, one is holding a Winchester Model 1873 Carbine, and another a Winchester Model 1886 saddle ring carbine (the large caliber / bore ammunition can be seen on his ammo belt). The photograph is believed to be taken outside of Fort Meade in South Dakota and dating to the 19th Century. The image also shows a dozen western frontiersmen seated on the fort fence looking onto the Indian ceremony. The image shows exceptional detail and is in fine condition. Cabinet card measures overall 4.25"x6.5". Provenance: From a large Montana and Western Ephemera and Photograph collection in Bozeman, Montana. Other L.W. Stilwell photographs have sold at auction for as much as $6,000 for the Comanche Jack cabinet card sold by Cowan's at their 6/13/2014 sale.